Y Cwtch in Cardigan, near Aberforth sleeps 2 people. Y Cwtch near Aberforth is situated in a truly magnificent location on the banks of the glistening River Teifi within mature grounds and on a 100-acre working farm; this traditional Welsh barn conversion, one of a pair, has been beautifully restored to its former glory to provide a perfect retreat whatever the time of year. Ceredigion, home to the dramatic Heritage coastline with wild inlet bays, golden beaches and tranquil fishing villages, provides the perfect destination in which to unwind and relax or explore. The stunning beaches of Tresaith, Penbryn, Llangrannog and Mwnt are just a few worthy of a visit and several beaches are dog friendly all year round. 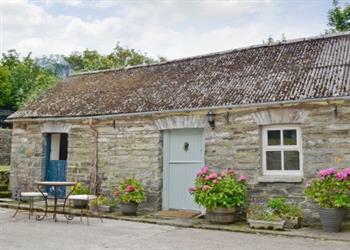 The holiday property itself is adjacent to owners 18th-century farmhouse, and has been lovingly renovated with stylish décor and furnishings throughout. Lying beneath the living room’s beamed ceiling, the wood-burning stove, thick stone walls and a host of comfortable furnishings provide the perfect ingredients for cosy night in. The quirky galleried bedroom is ideal for a lazy morning’s rest, as is the lawned garden to the rear where the flowing river can be heard. Guests are invited to stroll admist the owner’s extensive grounds, which are home to resident horses, goats and lambs during the spring, or for the more adventurous, head down to the fast flowing waters of the river and enjoy the peace and tranquillity it has to offer, which makes it perfect for water-based activities such as kayaking, canoeing or salmon fishing. The property is conveniently located close to the iconic Pembrokeshire National Park, and guests can ramble the majestic Preseli Hills and discover picturesque walks and ancient monuments, including the Bronze Age burial chamber of Pentre Ifan Dolmen, which stands beautifully in rugged terrain. The nearby market towns of Cardigan, Newcastle Emlyn and Carmarthen are all rich in Welsh culture and offer a selection of traditional pubs, boutique and antique gift shops, along with some tasteful restaurants waiting to be explored. Ramble the Heritage Coastal Path and enjoy spectacular views across Cardigan Bay which is home to resident bottle dolphins, harbour porpoises, grey seals and a variety of rare sea birds. The popular coastal resort of New Quay is just a stone’s throw away which features a good selection of cafés, pubs and restaurants which cling to the sides of the hills rising above the crystal blue waters of the bay. The charming regency town of Aberaeron, with its multi coloured houses and attractive harbour, is well worth a visit, as is the university town of Aberystwyth, with its wide range of shops, National Library of Wales and free museum. A trip on the picturesque Rheidol Valley steam railway can be taken from here to Devils Bridge in the nearby scenic Cambrian Mountains. The beach is 3 mile, with the shop, pub and restaurant all 1 mile from Y Cwtch near Aberforth. Spacious, beamed, open-plan living/dining room with wood-burning stove, galley-style kitchen area and tiled floor. Shower room with toilet. First floor: Galleried double bedroom. Pets allowed at Y Cwtch. For a better idea of where Y Cwtch is, you can see Y Cwtch on the map below. Y Cwtch is in Dyfed; should you be on the lookout for a special offer, you can find all the special offers in Dyfed. It's always worth checking to see what is on offer at the moment. Do you want to holiday near Y Cwtch (OY5), you can see other cottages within 25 miles of Y Cwtch; have a look to find your perfect holiday location.